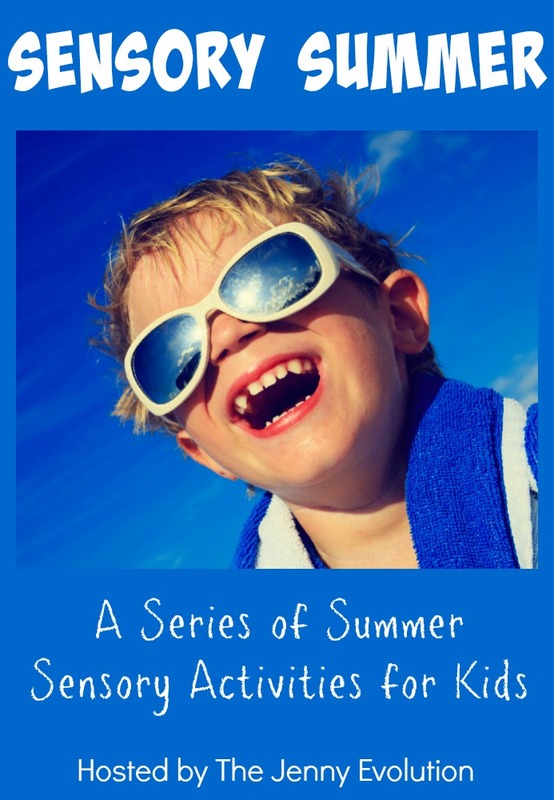 Summer is the perfect time to get your little ones outside for some fun sensory water play. And these water play toys are the perfect way to get your kiddo splashing. 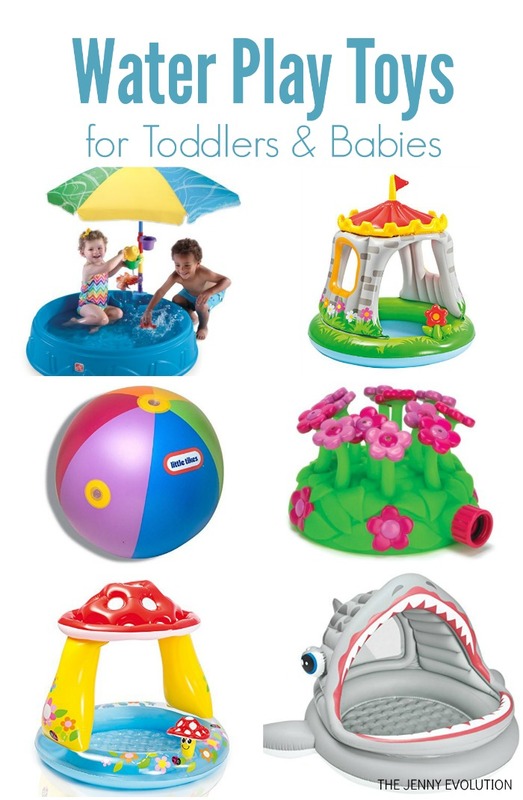 Keep cool with these favorite toys for water play toys for your toddler or baby. This post contains affiliate links. 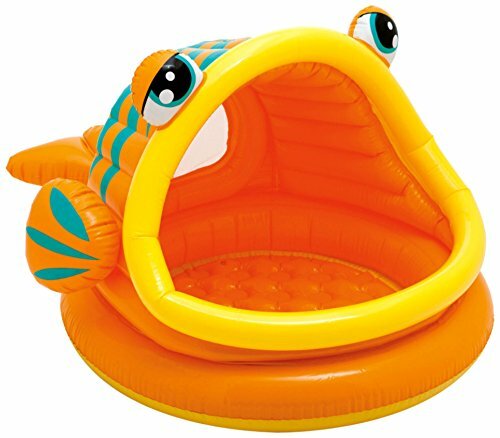 Intex Lazy Fish Inflatable Baby Pool, 49″ X 43″ X 28″, for Ages 1-3: Splash and play inside a fun, lazy fish with the Intex Lazy Fish Shade Baby Pool! A built-in sunshade provides partial protection from the sunlight. A soft, inflatable floor is included for extra comfort while you play. Step2 Play and Shade Pool: Fun for all at this toddler pool party. Includes two molded-in seats, umbrella and funnel cups and spinning wheel for endless sand fun. Features two molded-in seats. Designed to hold a 40” (101.6 cm) umbrella that nests nicely on the side of the pool providing shade for your little one at play. Includes 3 funnel cups and a fun spinning water wheel that attach easily to the umbrella post for added play. Molded-in designs at the bottom of the pool provide traction for little toddler feet. 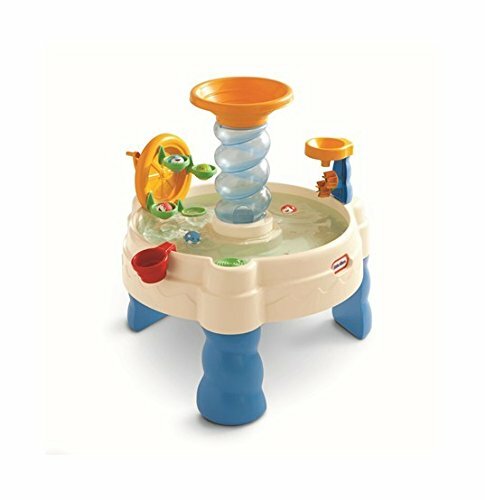 Little Tikes Spiralin’ Seas Waterpark Play Table: This fun Little Tikes Spiralin’ Seas Waterpark kids water table is loaded with features and ways to play. Kids will improve fine motor skills, sharing skills and their imagination while having a splashing good time. See how the water makes the wheels turn, or just splash around with these fun outdoor water toys. This dynamic water table for kids is just the right height – toddlers will play for hours! 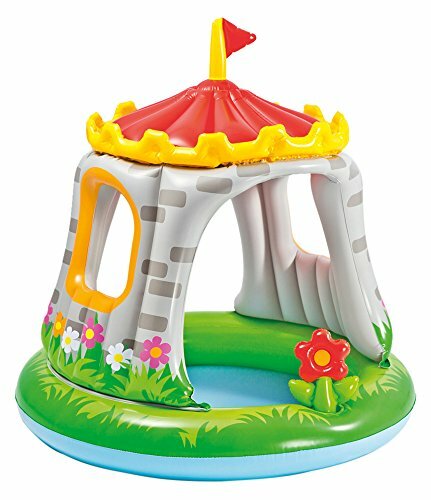 Intex Royal Castle Baby Pool for Ages 1-3, 48 x 48″: Enjoy a beautiful day out in the yard, relaxing and cooling off in the sun with the Intex Royal Castle Baby Pool. It features a built-in sunshade that will make your little one feel like a king or queen and an inflatable flower that’s removable. 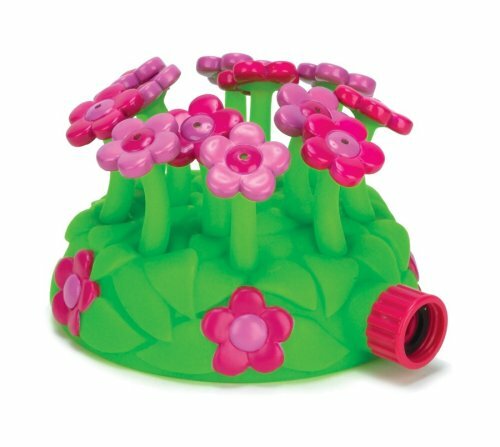 Melissa & Doug Sunny Patch Blossom Bright Sprinkler: Fun will bloom in an instant when this beautiful bouquet of flowers is connected to your garden hose. It’s easy to keep cool when this sprinkler goes into action! 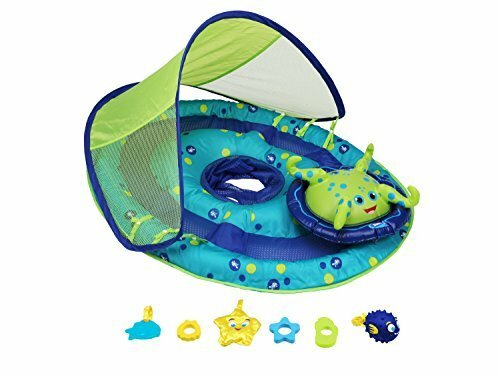 Swimways Baby Spring Float Activity Center with Canopy: Introduce your baby to the water with the SwimWays Baby Spring Float Activity Center with Canopy baby float! 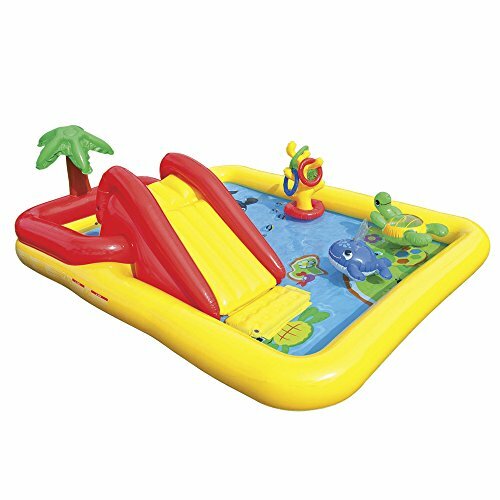 This brightly colored inflatable baby floaty has fabric covered inflation and a soft mesh seat for durability and comfort, and the lower center of gravity, safety valves and separate air chambers ensure security and stability while in the water. The rotating octopus character provides a focus for play with each octopus tentacle holding a toy that baby can touch and activate. The removable, two-position canopy offers UPF 50+ sun protection, and the mesh sides of the canopy ensure baby is visible at all times. Ultra-portable, the Baby Spring Float Activity Center and canopy folds flat into the included carry bag for storage and travel – it’s the perfect baby float for vacations! 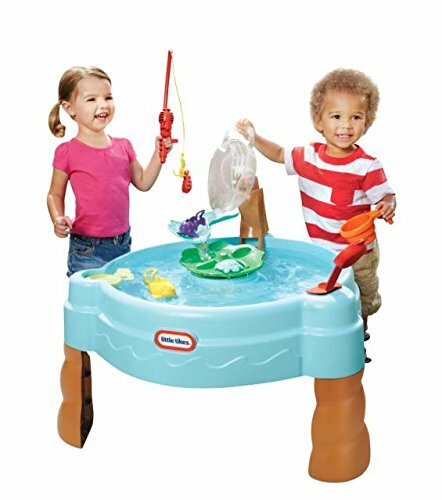 Little Tikes Fish ‘n Splash Water Table: With the Little Tikes Fish n Splash Water Table, little fisherman can catch and count colorful little pond swimmers right in their own backyard! Plus there’s lots of fill, pour and splash extras to make water fun.so much fun! Fill the fish bowl with water and watch it come splashing down, or try to launch your critters across the pond and onto the lily pad. Includes 10 accessory pieces for water play! Intex Dinoland Inflatable Play Center, 131″ X 90″ X 44″, for Ages 3+: Transform your backyard into your very own mini waterpark with the Intex Dinoland Play Center. Children will have hours of refreshing fun with this four-games-in-one prehistoric-play center! 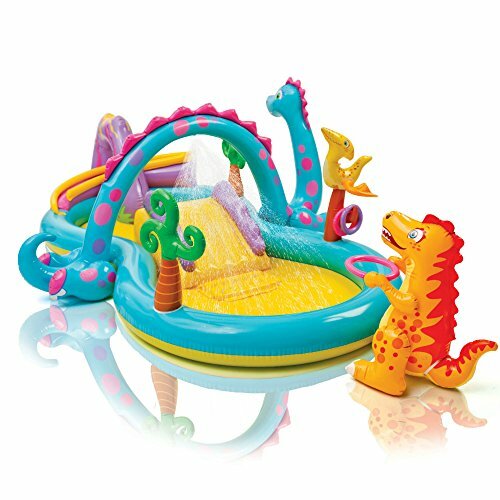 Slide and splash into the wading pool or have Jurassic fun with Dino Hoops and Volcanic Ball Roller games (with six colorful Fun Ball included). Keep cool with the movable Dino Arch water spray which attaches to a water hose. An included soft slide with a landing pad will be a delight to everyone. Intex Ocean Inflatable Play Center, 100″ X 77″ X 31″, for Ages 2+: For exciting summer fun just attach a garden hose to the Intex Ocean Play Center after inflating and you’re set! The fun, bright colors are sure to get kids in a good mood and the inflatable turtle, whale and ring toss game are a definite hit. The built-in spraying rim features a control valve to adjust the water flow to keep you comfortable. 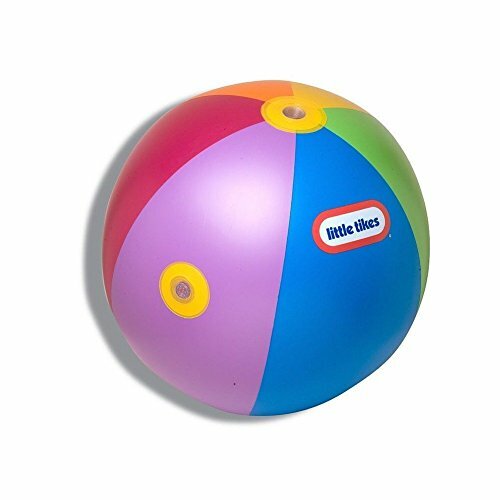 Little Tikes Beach Ball Sprinkler (88 Inches) (Colors May Vary): Roll around the giant 88″ beach ball for a splashing good time! This cool sprinkler combines fast and fun beach ball action with wild water play. Inflate it, hook it up to a water hose and then watch the fun begin! Awarded Parents’ Choice Award by Parents’ Choice Foundation. 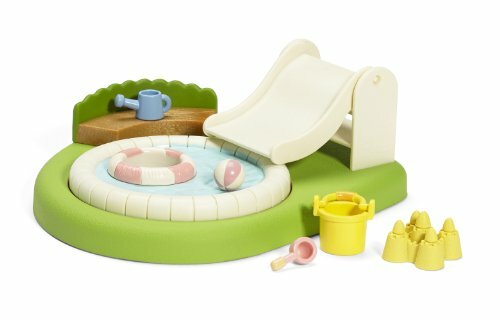 Calico Critters Baby Pool and Sandbox: Calico Critter babies enjoy having fun in the sun. Flip the pool over to reveal the sandbox. 2-in-1 fun. 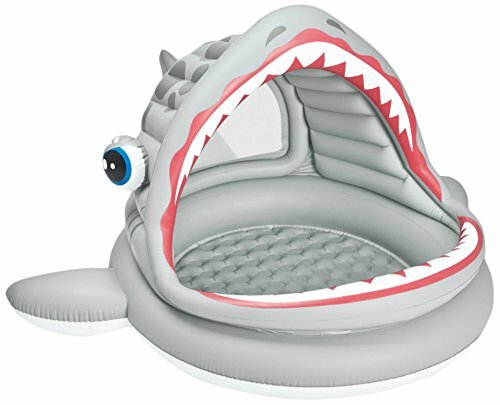 Intex Roarin’ Shark Inflatable Shade Pool: Enjoy your summer days splashing and playing in an adorable Intex Roarin’ Shark Inflatable Shade Pool. Perfect for toddlers two years old or older, the wide mouthed shark pool is entertaining and fun. This baby pool is designed for maximum comfort, with an inflatable floor and a built-in partial sunshade. 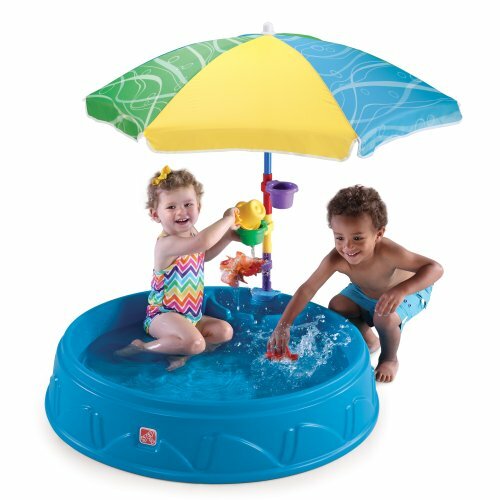 Intex Mushroom Baby Pool for Ages 1-3, 40 x 35″: Designed for children ages 1-3, the Mushroom Baby Pool is a great way to escape the summer heat with your little one. 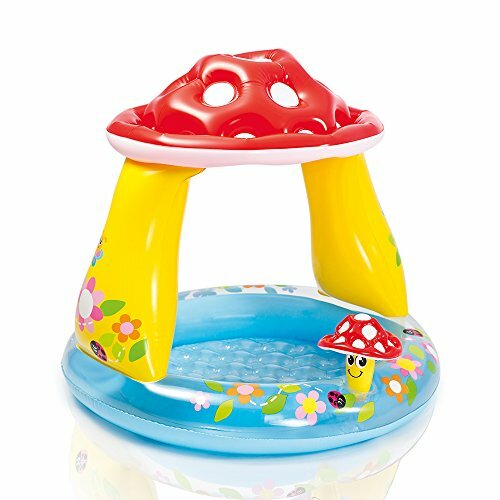 It features a fun, mushroom-style sunshade and matching inflatable mushroom buddy that will get everyone excited to splash around. 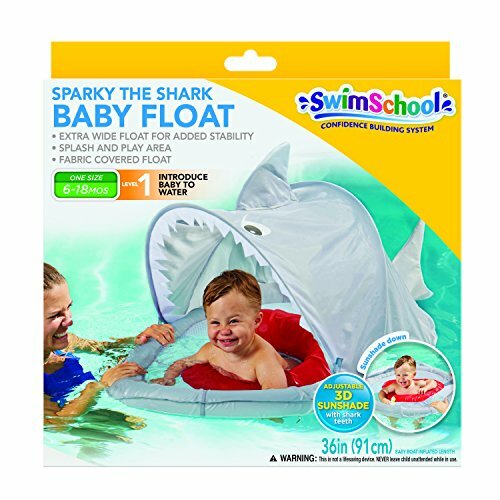 Aqua Leisure Sparky The Shark Baby Boat: Be the coolest kid on the block, with Sparky The Shark Baby Boat and bring a smile to your child’s face while turning heads at the pool! Extra wide boat design provides maximum stability and puts baby at ease while adjusting to the water. Splash & Play area helps mom and baby engage for hours of fun. UPF 50 Sunshade with Velcro straps can be either raised to help keep baby cool & protected from sun’s harmful rays or lowered depending on weather. Amazing idea. Kids love to play in outdoor. I like this water toy for toddles. In hot summer kids must like it. I feel relax and comfortable to play with water toy. Nice blog! Kids love water. Water play is a great fun play for my little girl like every child. I always try to give best water toy to my litter one. She loved it so much. Thanks for sharing some best water toys for kids.Kids really loved this toys. In hot summer it will best choose for mom i think so.